With recent advancements in EEG sensor technology, what once belonged to the realm of science fiction has quickly become science fact. Today, it’s possible to interpret brainwaves, and put that data to good use for people of all ages thanks to EEG headsets. One key way this data can be used is by measuring the attention spans of students, helping them improve their overall learning experience. In this post, we provide examples of some of the top apps and research created by our innovative partners, designed for self-improvement with NeuroSky’s MindWave and MindWave Mobile EEG headsets. The (Brain) Wave of the Future! NeuroSky’s MindWave and MindWave Mobile EEG headsets make use of EEG sensors to measure the brain’s electrical activity, or brainwaves. These biosensors translate brainwaves into action, which can then be transmitted to games and apps. The most affordable EEG headsets in the world, NeuroSky’s MindWave and MindWave Mobile can be found here. 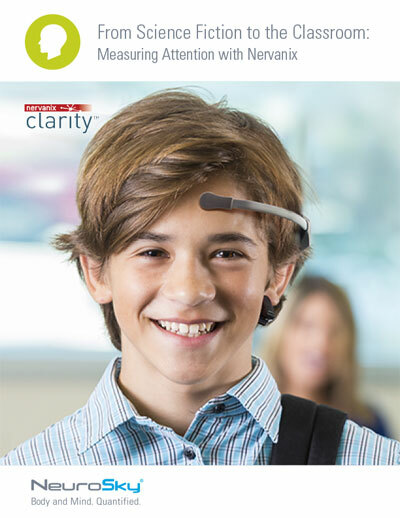 Nervanix Clarity – Nervanix is a pioneering force in what is known as “Attention Adaptivity.” Their Clarity app promotes attentiveness, while helping students stay on track and overcome distractions. Clarity works by measuring the attention level of a learner as they complete a variety of tasks. When their tasks are complete, the user is presented with information indicating areas where they struggled to concentrate, as well as where they were very focused. This lets users better understand their strengths and hone in on areas where they need to better focus their attention. This data can be tracked by parents, teachers and tutors in order to help the student become a more confident learner. Nervanix Clarity is available here. Focus Pocus – Focus Pocus measures brain level activity in a fun way for children. It lets users control and develop their own customizable wizard while engaging in 12 mini-games on their own or with a friend. The mini-games are focused on helping the user control their behaviours when they’re learning, playing, and interacting with others. Focus Pocus is available here. Attention Control: ZenZone – ZenZone is an app designed to promote concentration levels. It offers tools to block out distractions so a user can commit their full attention on a task. Attention Control: ZenZone is available here. Home of Attention – Home of Attention uses NeuroSky’s EEG headsets to measure a user’s brain activity, then visualizes it on a screen. It shows how brainwaves can be altered in order for a user to reach specific mental states. Home of Attention also allows music, games, and videos to be added to the mix for a more captivating experience. Home of Attention is available here. For more information on apps that use EEG headsets to improve attention, and to learn how developers are making their app ideas a profitable reality through the NeuroSky Developer Program, download the free Success Story, From Science Fiction to the Classroom: Measuring Attention with Nervanix.